I think it's fair to say that if you have been reading my blog for a little while, you'd know that I love dates! I've loved these delicious, sweet, sticky, dark blobs of energy since I was little.... my mum's vice has always been dried fruit and whilst apricots were her go-to fruit, there was always sultanas, prunes, apples and dates in the cupboard too. However back in the day, if Medjool dates were available they would have been prohibitively expensive, so we settled for the no frills "dried cockroach" style cooking dates. Dates are just bursting with antioxidants, fibre, potassium and magnesium and whilst Medjools are delicious for snacking straight from the fridge, the cheaper dates can prove to be a delicious tasty treat as well. Simply add a bit of water and cinnamon and pop them in your high speed blender to make a lovely rich caramel. 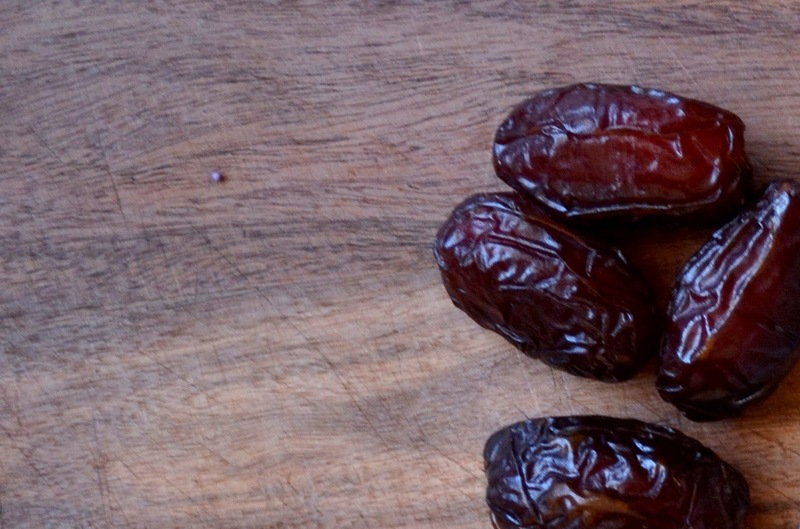 The ratio should be about 2:1 dates to water; but as all brands of dates and blenders are different you'll most likely need to adjust it to your own taste. Slice a banana into rounds, spread each layer with date paste and stick together to make a stripey layered dessert. Sprinkle with cacao nibs and pecans. Just eat it from the jar!